Dave and Lillian are proud to announce the revised edition of Towards Understanding is now available as an e-book via Booklocker.com; the original edition is still available in paperback format, and in the summer of 2009 the publishers released a limited edition in hardcover - which was quite an experience for Lillian. Towards Understanding (revised edition) is a collection of 125 non-fiction poems written in chronological order. It is a true story of a young pre-teen female growing up on her own, struggling to survive, breaking the chains of inner demons & finally growing towards understanding of her value & purpose in life – but not quite reaching it. Thus the title… Towards Understanding. The reason why Lillian wrote the book originally was to show other victims of abuse, violence & neglect that they can live a wholesome life without baggage from the past. Second to that Lillian wanted to provide a road-map that showed the healing process that victims go through, letting others know they are not alone. People who are involved with victims can learn what that person is going through or will go through and therefore they might be able to provide a better support system. The original version of this book, with 120 poems, is still available in paperback and hardcover by ordering through most online or your local retailers. Dave's cover design for this newly revised edition hints at the theme of "leaving footprints in the sand" or deciding on the legacy we choose to leave behind. Lillian is particularly fond of his idea for signing the author name in the sand. This new revised edition offers 5 new poems, creating an ending that Lillian is much more comfortable with, along with updated author information - and a few other revisions. Check out the new e-book (only $8.95 - US funds) at: http://www.booklocker.com/books/4179.html Follow the author as she battles her past demons, raises her voice in anger, discovers self-awareness and recovers from and intense relationship bordering on obsession. You will witness the healing, as she becomes aware of the value of her life and falls deeply in love with a wholesome man. Finally, able to see beyond herself she starts to question society and endeavors to understand others. She discovers a love for nature and a dedication to the health of the Earth. As is evident, the author has fun experimenting with different writing styles and altering rhythms with words. Lillian Brummet's award winning poetry has appeared in five hardcover anthology books and numerous publications in North America, Africa and the UK. She has had the honor of attaining "Editor's Choice Award for outstanding Achievement in Poetry", not once - but twice. 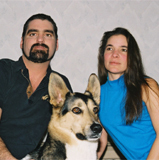 Lillian co-authored an environmental book, "Trash Talk", with her husband Dave. 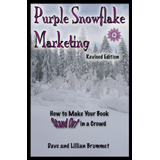 The couple recently released an ebook entitled "Purple Snowflake Marketing - How to make your book stand out in a crowd". Their articles continue to appear in publications across the globe. Lillian also finds time in her busy schedule to write book reviews professionally.